Perfect contemporary addition to our guest room! 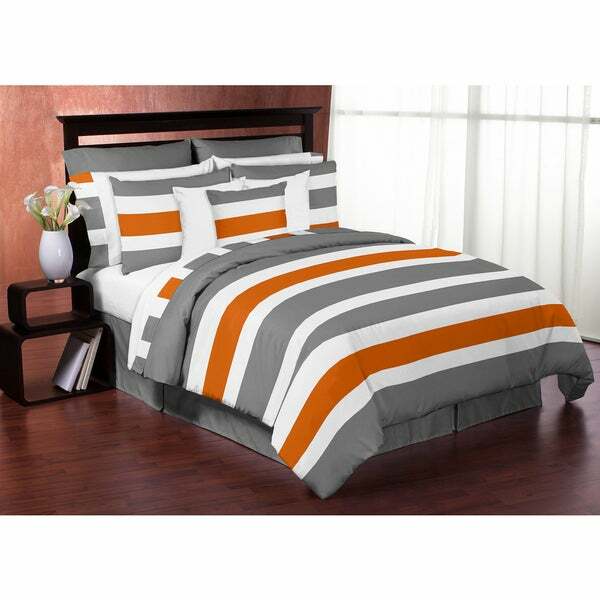 Featuring a beautiful stripe pattern with a white, grey and orange coloring, this full/ queen-size comforter set from Sweet Jojo Designs will make a stylish complement to your bedroom decor. The comforter set is made from soft microfiber with a modern design and is machine washable for easy care and cleaning. This is a nice set for a pre-teen with bright happy colors and warm comforter. Matched with nice grey sheet set, it made for a warm cozy bedding The price is just right. The strips are just the right size. The comforter is very comfortable and feels do soft. Nice fluffy comforter! Love the color and modern design, it matched my sons room perfectly! But, does not hold up very well to the wash cycle. Some of the stitching and shape of the comforter started to break down after the 1st wash.
Just what we were looking for in a comforter! "Is the orange a bright orange or a darker burnt orange color?"